Time for a short break from Media Center postings. I was going to blog about Greyhound racing, but then, I was going through the picture galleries on Joe's blog when I found something else to blog about first. The above picture is one of the Bridge of Sighs in Oxford. The Bridge of Sighs was built in 1913, between two buildings of Hertford College. It is named after the Bridge of Sighs, or "Ponte dei Sospiri" in Venice, but in fact looks nothing like it as you can confirm yourself. What does this bridge have to do with the Turf Tavern you ask? Well, just under the bridge, there is a narrow passage called the St. Helen's Passage, originally known as the Hell Passage. If you look closely at the bricks, you'll see this. 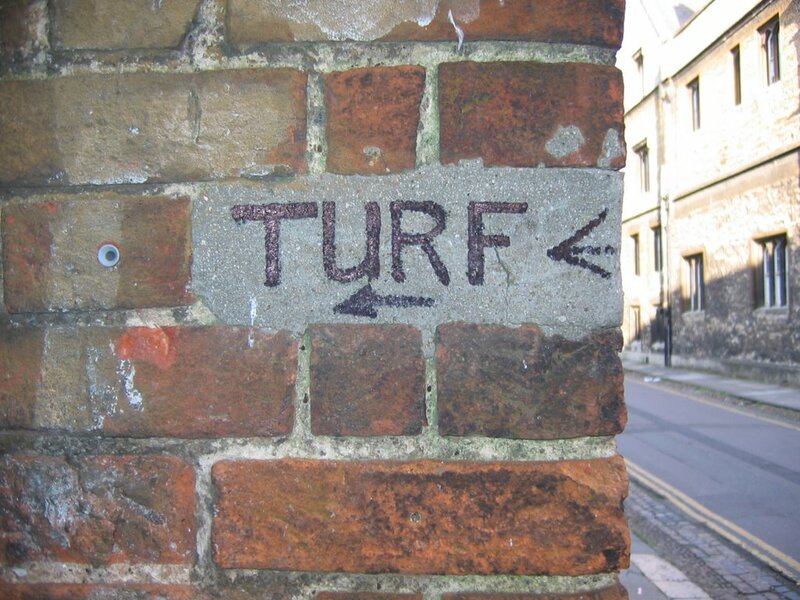 If you walk through St Helen's Passage to the end, you'll reach the Turf Tavern. 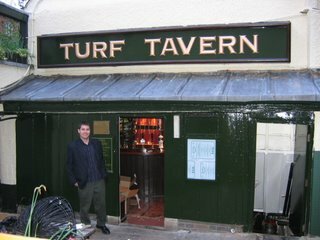 The Turf Tavern (or just the Turf) dates originally from the 13th century, but most of the present building is 16th century. It lies snugly alongside city wall. The pub is very small, with low beamed ceiling. 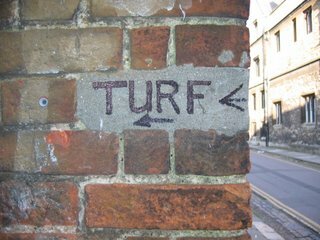 Although popular and often crowded, it is the only pub in central Oxford with a beer garden so there is some room for overflow. 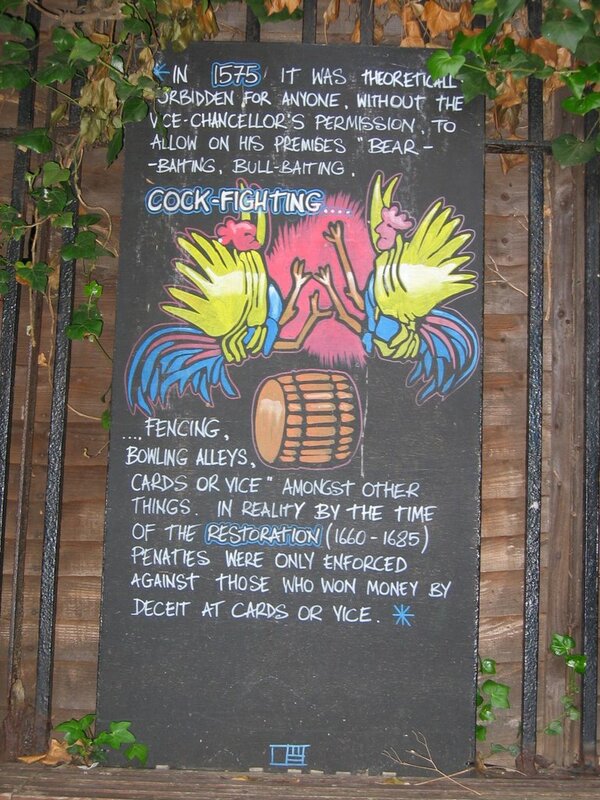 There is a lot of history behind this pub. 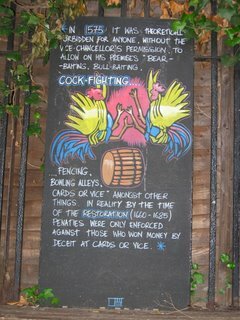 It was alledgely the setting of the last cockfight in England. 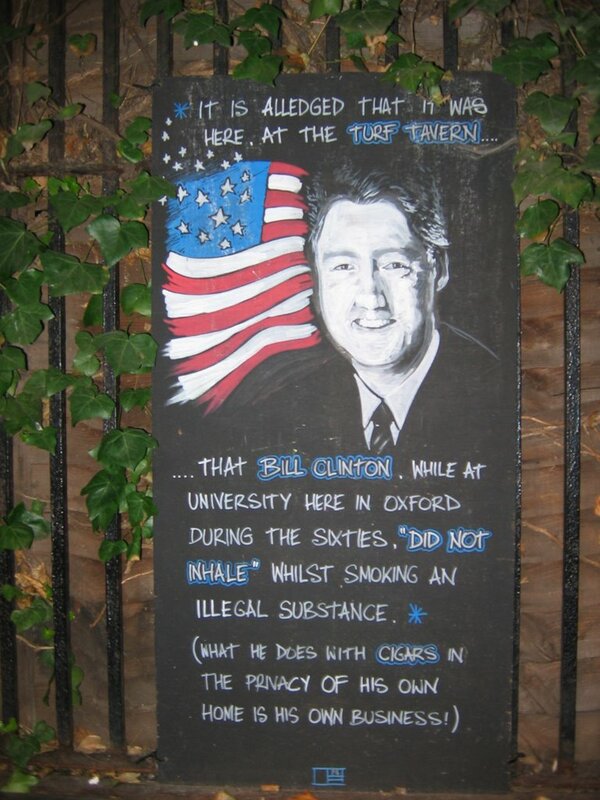 It is also where Bill Clinton "did not inhale" when he was attending Oxford in the 1960s. 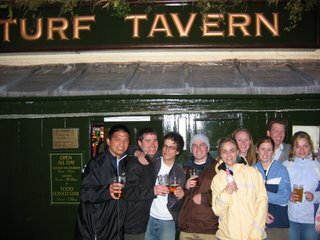 While we were in Oxford, we visited this pub many times, during lunch, the afternoon, early evening and before last call. This place is an unmissable Oxford institution that many consider to be the best pub in the city. 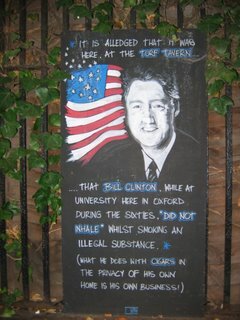 If you ever get the chance to goto Oxford, don't miss this well hidden gem. Here are a few more pictures of us. AMD, in a response to Intel's Viiv initiative, is poised to formally introduce AMD Live! to the world later today. However, the specs are available now and are described here. To have an AMD Live! capable machine, your computer must meet the following requirements. GigE LAN and optional 802.11b/g (a is optional). Support for low profile form factors. Of importance are acoustic and thermal demands that AMD has specified. Emphasis is placed on cool and quiet operations. To achieve this, the use of items such as low-noise system fans, CPUs with a low thermal design power, and SATA hard drives with fluid bearings will be required. Microsoft's Away Mode will also be a requirement for AMD Live! compliant systems. What is Away Mode? Away Mode allows the computer to appear off to the user while it continues to perform tasks that do not require user input. Such components can include, but are not limited to: displays, keyboards, mice, remote controls, and other items deemed to be non-essential. The system would continue to operate in such a manner so that tasks such as file downloads and data transfers can continue take place without the need to power unneeded devices. A Media Center PC can take advantage of this for unattended television show recordings, or during use of (one or multiple) Extender devices. At this time, Microsoft's Windows XP Media Center Edition with Rollup 2 update is the only operating system to take advantage of Away Mode; however, expect to see this functionality further enhanced in Vista. More information about Away Mode can be found here. Reduced noise output from Media Center PCs. With the FIFA World Cup about to start in a couple of weeks in Germany, Microsoft has created a little applet that allows you to follow your favorite teams and players. This program gives you access all the latest tournament news and information. Live game data will allow the a user to monitor the progress of your favorite teams. You can view upcoming games for various teams, their standings in the group and knockout phases of the tournament, and find out about updated news all from this app. This app includes an RSS reader, so you can plug in a RSS feed of your favorite soccer news source (e.g. Soccernet or BBC). Ever worry about missing games due to the time conversion (Germany is Central European Time zone (CET) with the appropriate adjustments for Daylight Saving Time)? Fear not, as this app will convert all times to your local system time. Being the world event that it is, this application will support the following languages: Chinese (Simplified and Traditional), Czech, Dutch, English, French, German, Italian, Korean, Polish, Portuguese, Portuguese (Brazil), Russian, Spanish, Spanish (Latin America), Swedish, and Ukrainian. If you are interested in this app or want further information, it is available here. I saw Da Vinci Code yesterday afternoon. Having enjoyed listening to the audiobook a couple years ago and then reading it a few weeks ago, I looked forward to seeing it. Those who know me know that I hardly ever goto the theaters to watch movies; the latest one I saw prior to this was Harry Potter and the Prisoner of Azkaban. I'm not going to review the movie, or go into the issues that the movie raised. You can do that on your own or read the countless reviews that have been published by others. However, I would like to point out two things that I noticed in the movie. First, Sophie Neveu's SmartCar in the book was red. She describes it in the book within the following quote. "Mine is the red SmartCar in the employee lot...." The SmartCar in the movie was white. It seemed odd to me that they botched this detail. Even someone with Albinism would be able to tell those two colours apart. Second, the use of the GPS dot was not quite accurate. In both the book and the movie, Fache has one of his lieutenants plant a GPS dot in Landon's pocket. The GPS dot is said to be "is accurate to two feet would Langdon's location, no matter where he is." In real life, GPS is accurate to between 4 to 100 meters and doesn't work well indoors, under dense tree cover or in urban areas with tall buildings. Why? The receiver has to have an unbroken line of sight to the GPS satellites, something it doesn't have indoors and underground (e.g inside the Louvre Museum). For more on how GPS works, see here. One could nitpick forever, but I guess all movies require some suspension of disbelief to move the plot along. Regardless, I enjoyed the movie a lot and I am glad I saw this one in a theater. If Dan Brown's Angels and Demons is made into a movie, I think I'd go see that in a theater too. Because different kinds of computer users need different features in their operating system, Microsoft will offer multiple editions, or retail “SKUs,” of Microsoft Windows Vista, each oriented to the needs of specific types of customers. The main goal of the Windows Vista lineup is to more closely align the product offerings with customer demand, rather than forcing customers to make tradeoffs between functionality and form factors. As an example, with Windows XP, you cannot combine Media Center and Tablet PC functionality in one operating system; you could only have one or the other. With Vista, the various editions were designed so that each major customer segment—consumer, small business, and medium and large business—would have at least one entry-level edition and a premium edition. What does this mean for those that want to use Media Center in Vista? Make sure you get either the Home Premium or Ultimate edition as these are the only 2 editions with Media Center functionality. As an aside, Tablet PC, also a separate Windows XP edition like Media Center, will be included as a capability in the Windows Vista Home Premium, Business, Enterprise, and Ultimate editions. Another advantage with Windows Vista is that you no longer need to choose between 32-bit and 64-bit versions. Both versions are available with every product edition except Starter. 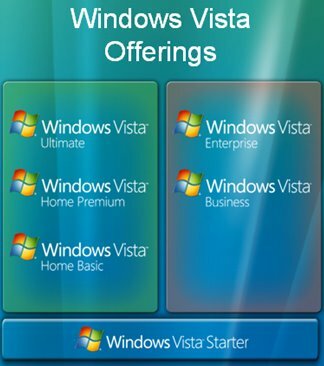 For those of you that wanted Tablet PC and MCE functionality together, Vista will give you both of these capabilities together in one operating system, so you can see the possibilities that this presents, when you have all the necessary hardware. Alternatively, for those of you who need MCE with Domain support (through official means) and have Extender support, Vista will allow for this in the Ultimate SKU. For a detailed breakdown of what is available in each Vista Edition, take a look at the Windows Vista Product Guide starting in Section 2 (Page 7). You can sign up products or try products in various stages of their product development cycle. There are also links to blog sites that are available for some of the products. One thing that interested me was the addition of real-time traffic to the Windows Live Local product. When users look up directions using Live Local, the system will now take into account traffic issues as reported by Traffic.com, routing around any potential problems. Unfortunately, this is available in selected US cities only. Also new is increased integration between Live Local and other products (Outlook and Live Messenger). There is now an Outlook add-in that integrates Live Local's mapping capabilities into the Outlook's calendar feature. This will allow users to better manage their travel schedule and easily share meeting location information within Outlook Calendar requests. Windows Live Messenger now features Live Local integration as well. Users can interact with the same map by opening a sharing session from the Actions menu. Microsoft is really hoping that this Windows Live initiative will product programs that work simply and effortlessly together. Try it out, and see what you think. A few of you have asked what I am doing this summer. Training for the 50 km bike ride is going alright. I think I will be really close to my goal of doing the bike ride under 2 hours. I'll also be starting to look for a job in September. I applied for an internship position through the UNAC's JPC program, so hopefully that comes through. Should be finding out about that within the next couple of weeks. If I am successful, all the better, if I am not, then it was a good attempt. I'll be looking for either a Planning job or a job in the tech field, whatever I can get, and hopefully in the Greater Toronto Area. I'll be volunteering at the Rogers Cup tennis tournament in Toronto this summer. I have been volunteering as a member of the Transportation Committee for the last 9 years. Essentially, this committee is responsible for providing efficient transportation for the competitors, officials designated VIP's beginning Wednesday prior to the Tournament and running through to the Monday following the finals. I have been promoted to the Committee Head for this committee, so I am also involved in the management of the 130 volunteers in the committee, as well as much of the planning that goes into ensuring that everyone's transportation needs are met. As we get closer to the tournament, I'll be sure to blog about that. With the number of betas that Microsoft has released, I'll be busy testing out some of the latest products that should be out on the market soon. From Vista, to Office 2007, to the Windows Live products and other products that I can't disclose at this point, there's quite a lot coming down the pipe. Lastly, I've been working on figuring out a layout that I like for this site. I've switched from the default two column layout that blogger provides to this three column layout. I think I'll stick with this one for now, and hopefully I haven't broken anything in making this switch. It figures that one day after I post an entry on getting the latest drivers for your Media Center Computers that ATI releases the Catalyst 6.5 drivers for Radeon Video cards. Catalyst® 6.5 introduces a new option for Overlay Theater Mode. The new option, Standard Dual Mode is available for Radeon® X1x00 series of graphics cards. This new feature now allows users to playback video using hardware acceleration when it is played on both displays (clone mode). Hardware acceleration decreases CPU utilization, allowing the PC to run smoother and faster. When using two displays in clone mode, video playback will be identically displayed on both display devices. For Radeon® X1000 series products (Avivo Video) overlay is per-display and true overlay will be used for both displays. For pre-Radeon® X1x00 boards, there is only one hardware overlay, so video on the second clone display device is either software-rendered (i.e. "Same on all" selection) or the Windows desktop is displayed but the video will not show through thecolor key (i.e., "Standard mode" selection). Adaptive Anti-Aliasing smoothes out the surfaces in an entire scene unlike Multi-Sample which works only on edge surfaces. Adaptive AA has the ability to work on transparent or opaque texels, like those that comprise a surface texture. Previously this feature was available on the ATI Radeon® X1000 family products. Starting with Catalyst® 6.5, Adaptive AA support is now available to ATI Radeon® 9500 products and above. Extends the Windows experience to full-screen entertainment that you can manage with a remote control. Find, share, and enjoy all your photos, music, home videos, radio, DVDs, and even recorded TV programs in one sleek and easy-to-use place. Enjoy the complete Windows Media Center experience on any TV in the home when you’re connected to a Media Center Extender device such as Xbox 360 and a home network. Now includes full HDTV capability. The built-in Electronic Program Guide (EPG) and Movie Guide save you time and hassles when looking for programs in your broadcast, cable, or satellite TV lineup. - the new miniguide functionality lets you browse the EPG without having the tv image shrink into the corner. you also avoid the delays associated with channel switching. access mini-guide mode with the direction arrows on the remote while watching tv. Enjoy your photos and home videos on the TV, play photo slide shows with a soundtrack, and burn your photos and home videos or downloaded videos to DVD. Windows Vista Home Premium and Ultimate editions ship with a codec pack that enables DVD playback. Windows Media Center has an easy Play DVD feature, and by connecting to external DVD changers you get quick access to your entire movie collection through the Windows Media Center interface. - Hopefully this inclusion of the MPEG2 decoder cuts down on the numerous codec issues that people encounter in the newsgroups and other MCE-related forums (the codec is also needed for Live TV/Recorded TV). Windows Media Center supports two dual-tuners, allowing you to record or enjoy programs on different channels. - I'm not sure if this is correct or not, but that's what it says in the guide. I'll get more info on this shortly. Allows the original equipment manufacturer (OEM) to configure the PC to start up like a consumer electronics device at the click of a button. It also enables an option to lock the Windows Media Center experience so users can’t easily navigate away from it. - Hopefully this isn't like Away Mode where non-OEM users effectively have no access to these features. So maybe I should elaborate on Ben's posting. 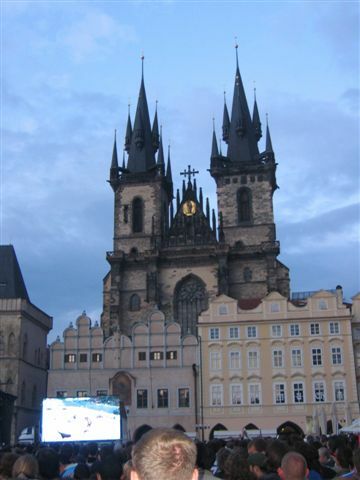 This picture definitely brings back fond memories of Prague. Like my friend, Isaiah, often said during our trip to Europe, "It's all about the stories." So here is this one, as much as I can remember. After our Oxford exchange trip, many of us went to Prague. Being citizens of our hockey crazed nation, we all followed the World Hockey Championship (seeing as there the NHL was on strike, this was all we had to follow). We arrived in Prague on Saturday night, knowing that Canada was playing in the semifinal game, and that the Czech Republic had won their semifinal game to get into the finals. As we checked into the hostel, we found out that Canada had won. 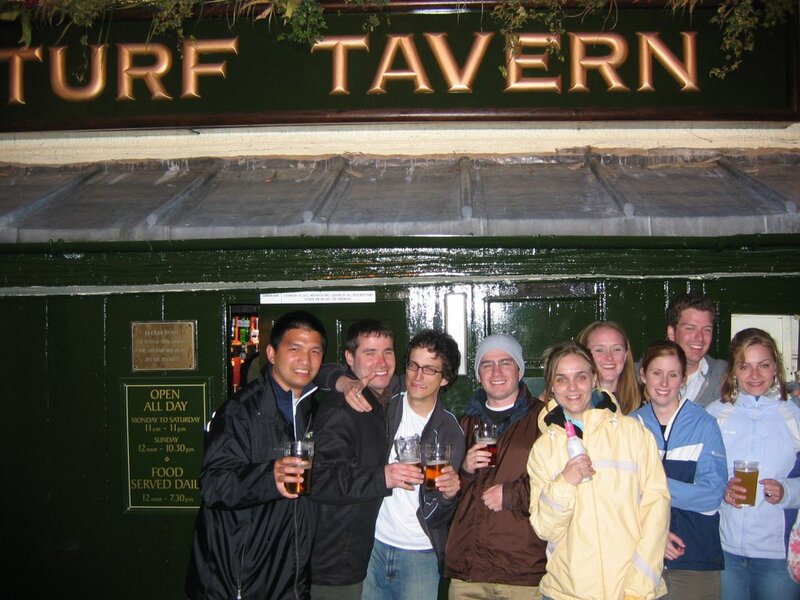 After we checked into our hostel, we headed off to find a bar. 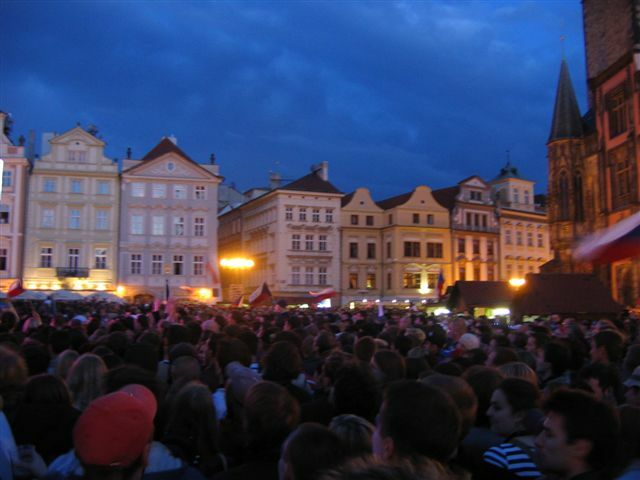 It was a nice change to see that bars in Prague served until midnight, unlike bars in England, where they had, until recently, only served until 11:00pm. We only had about 15 minutes, so we had our prerequisite drinks, we still wanted more alcohol. We asked the bartender where we could get more beer for the night, and his response, in a thick Czech accent no less, was "I'll grab a big water bottle, and you can take the beer to go." That's right, "to go". The bartender then asked if that was all. It wasn't, so we asked for another. It was ridiculously cheap too, 100 koruna, Kč, which worked out to about $5 CDN. 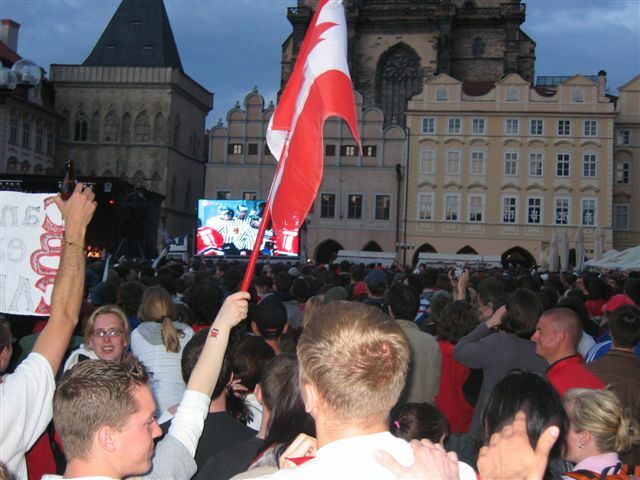 Just before we left the bar, a thoroughly drunken patron overheard us talking about hockey, and told us that since it was hockey that we wanted to see, we should watch the finals in the Old Town Square, as there were video screens set up all week long for public viewing of the the hockey games. He told us that over 50,000 would be there. Right then, we all knew we had to be there. 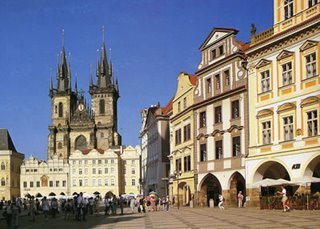 Prague is an amazing city. 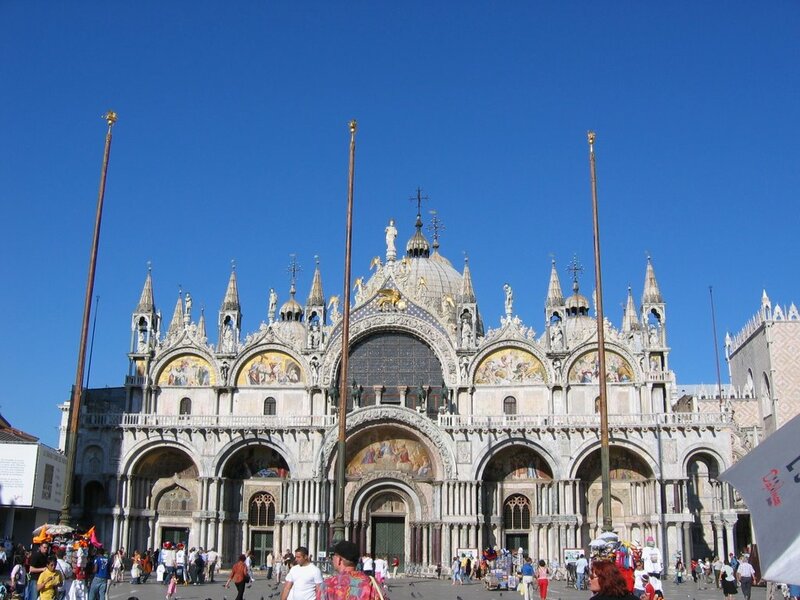 There are lots of sights to see and the food & drink is relatively cheap and of a high standard. A compact city centre made walking between tourist attractions really easy, and for the places that were further away, the subway system worked really well. 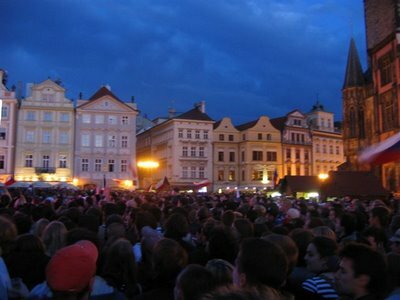 Later that night, we headed out to Old Town Square to watch the game. 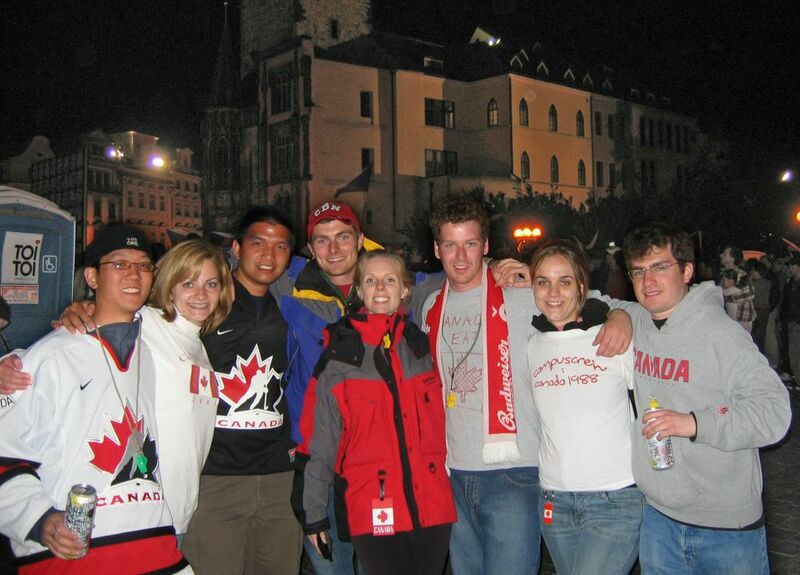 There were 8 of us, dressed up in various Canadian gear, heading out into a massive crowd full of Czechs. While we were heckled by the pro-Czech crowd, we still felt pretty safe. At times, we even found some other Canadians. We had four other classmates of ours who were also in Prague at the time (Hitoshi, Adam, Mark and Mark), but they were too afraid to come out with us. Their loss unfortunately. Unfortunately, Canada lost the game 3-0, relinquishing the World Championship Title which they had previously held for the last two years. After the game, the crowd went crazy. We had gone to a bar for some drinks, and about an hour later, people were still celebrating on the streets, in the subway and everywhere else we could see. The subway train that we were on couldn't leave the station because the crowd was jumping up and down inside the train. We had to wait a good 5 minutes before the train would move again. I guess we were fortunate to be in the right city at the right time to witness this amazing event. 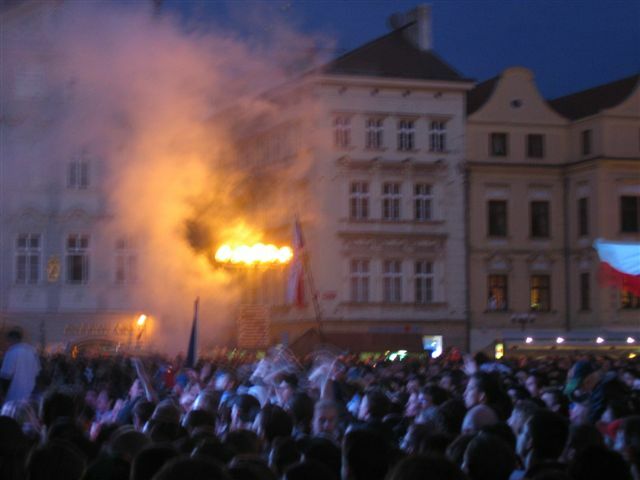 The Czechs, like Canadians, loved their hockey, and it really showed on this night. Below are some more pictures of our night in Prague, April 15, 2005 - I wish my garbage camera could have taken better night shots. We found some other Canadians! (see the Can't Beat Canada banner on the left)? As a Media Center MVP, Media Center Extenders are something that I am quite familiar with as I personally have 2 Xboxs with Media Center Extender functionality, in addition to an HP x5400 Extender. Here's a little tidbit about V1 Media Center Extenders, Xbox 360 (with its built in extender functionality) and Vista from the Windows Vista Product Guide of Vista Beta 2 that was just released earlier today. On Page 163, the following is stated. Except for Xbox 360, earlier versions of Windows Media Extenders are not compatible with Windows Vista. However, new Extender devices will be available with the release of Window Vista. I can't say I'm too thrilled about this. Hopefully, this doesn't affect the upgrade rates of those who adopted Windows XP MCE 2005 and its v1 Extender lineup. That said, with the growth of sales of the Xbox 360, many people will have the opportunity to try out extender functionality now, with MCE 2005, and in the future, with Vista. I'll have more information about this as it becomes available. So many of my friends know that I'm involved with Microsoft through beta testing and being a MVP. But what does that really mean? Through beta testing, I get to try out some of Microsoft's latest products before they are released. These range in different products varying between hardware and software. Some hardware I have tested include Microsoft Broadband Networking products, Microsoft Media Center Edition/Media Center Extenders and Microsoft Media Connect. Software that I've tested range from operating systems, like Windows 98, 98SE, Millennium Edition, 2000, XP and Vista; applications like Office 10, 11 and 12, MSN Messenger and other Windows Live applications and games such Rise of Nations, Flight Simulator and so on. There are a lot of products that I didn't list, but I think you get the idea. How did I first get involved with beta testing? It was sometime during the fall of 1997, when I was part of a group of students who maintained the computers at my high school (York Mills C.I. ), and I was complaining about some aspect of Windows. One of the members of this group, Noah Sumner, thought that one way to channel these complaints was through submitting feedback through beta testing. He nominated me, and the rest, as they say, is history. On a sidenote, what ever did happen to Noah? Beta testing has been an interesting way of trying new products/versions from Microsoft. By trying out the software, I have an opportunity to give feedback back to Microsoft product developers at various stages of their software development cycle. It is nice to see that the effort that I put into testing usually results in an improved final product. The Microsoft Most Valuable Professional (MVP) Program is an award and recognition program run by Microsoft. Microsoft MVPs are volunteers who have been awarded for providing technical expertise towards communities supporting Microsoft products or technologies. An MVP is awarded for contributions over the past year. I have been an MVP since 2001. I was originally awarded in the Windows - Shell/User category and was involved with the Windows Media Center category starting in 2002. I have since been switched over completely to the Windows Media Center category in 2004 and that brings me up to date on my current status. Being an MVP has been fun. Unlike beta testing, where software is in an unfinished state, the support avenues for software that has been released come primarily through some form of technical community involvement. I primarily help out in the newsgroups, especially the ones under the microsoft.public. * hierarchy; however, it is important to note that there are many other avenues to support software, such as through web forums, web support sites, on-site visits, blogs and so forth. What do I mean by supporting users? It ranges from assisting others in utilizing various features of the software, finding better ways to perform various operations within the software, to troubleshooting and suggestion solutions to issues that others may encounter while using the software. Not only do users get answers to the issues that they face from many others in the community, but those that contribute often end up taking something away from these experiences (whether it is learning something new, finding better ways to do things etc.). It is through this involvement in the community that I have been recognized by Microsoft; however, even without this recognition, I would probably participate just the same because of all the benefits that can be gained from participation. This involvement with Microsoft is centered on my interest with computers. To many, this is no surprise especially since I have been obsessed with computers since as far as I can remember. Some of you may wonder why I went into the School of Planning at University of Waterloo since I seem to be so into computers. The answer to that is that I actually was in the Computer Engineering program at the University of Waterloo before I switched programs. 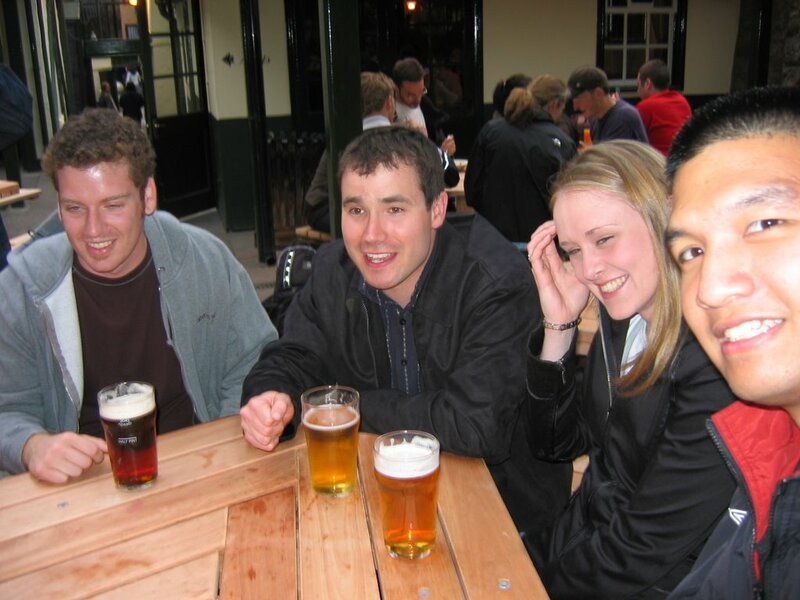 Fast forward to 2006, and I will be convocating with my classmates in a few weeks. I'll probably blog a little more about that as the time approaches. Hope that answers some of the questions about me and how I am currently involved with Microsoft. If you have any questions, feel free to ask. Today is Victoria Day here in Canada. It is a Canadian Statutory Holiday celebrated on the Monday on or before May 24 in honour of both Queen Victoria's birthday and the current reigning Canadian Sovereign's birthday. Unofficially, it also marks the beginning of the unofficial "summer season" in Canada, and as such, it is the weekend when many businesses, parks, and other seasonal businesses that operate during warm weather months, will open. 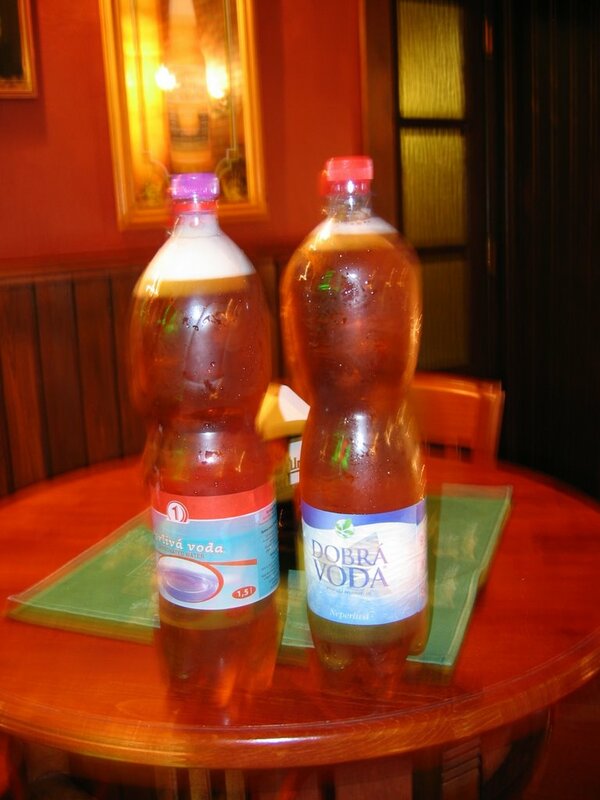 A two-four is slang for a case of 24 bottles of beer. It is important to note that the holiday is still referred to as May Two-Four even if it falls as early as May 18 (i.e. this year, the May Two-Four is being celebrated on May 22). I only bring up the May Two-Four reference because of something that happened in and around this time as year when I was in Europe. 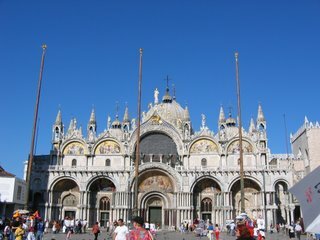 A few friends and I were on a bus heading to our accomodations while we were in Venice, Italy. Due to the Canadian flags on our bags, it was obvious what our nationality was. This Australian girl (Lauren) that was also on the bus must have picked up on this, and then proceeded to ask us about the May Two-Four. So we told her about Victoria Day. At this time, I assumed that it was something celebrated throughout the Commonwealth, but evidently I was wrong. 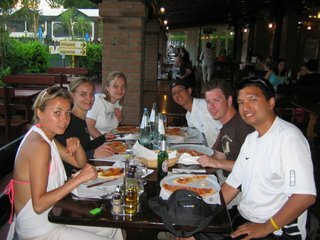 Here are Lauren (the Aussie we ran into), Lindsay, Natalie, Alvin, Ben and me having dinner. I've updated the F Lock page that I blogged about here. New to this update is a method getting rid of F Lock functionality for USB keyboards. I've also changed the link to the website, however, the old link will still work (it is being redirected to the new one). Check it out, and feel free to send me any feedback.